It’s been a busy and productive year so far, with USDA-funded new postdoctoral researcher Sarah Richman joining the lab, and new PhD student Anna Tatarko starting up electrophysiological experiments with Dennis Mathew. The past few months have also seen a new paper out on how pollen fatty acids influence bee learning, and (very shortly) we think our first in a series of neonicotinoid papers written by Felicity Muth will be out. Stay tuned! Exciting news in the lab! Felicity has been awarded a highly prestigious L'Oreal USA Postdoctoral Fellowship for Women in Science! This fellowship will allow her to take her research on bees, pesticides, and cognition in some new and exciting directions! For a full breakdown, check out the official Press Release! 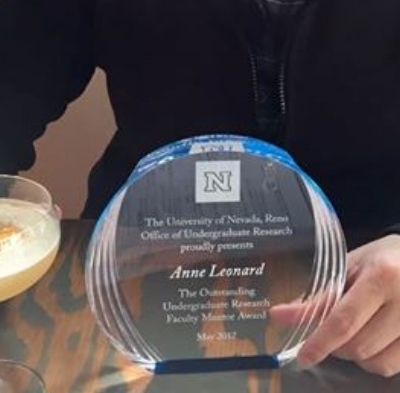 I was honored to receive the 2017 "Outstanding Undergraduate Research Mentor" award, from UNR! We try hard to create a research environment in which undergraduates have a chance to get a taste of science. Thanks everyone!!!! Springtime, and lots to celebrate! Devon won 4th place ($250) for her poster at the UC Davis Bee Symposium, and Felicity gave an excellent lighting talk! And, we had our annual Bee Bake Off!! Held annually in memory of Harvi Singh (a former undergrad who brought his A-game to bee-themed baking), we had many tasty contributions. This years's winner? Jake Francis! Pictured holding the "B" trophy, for his orange-buttercream bumblebee macarons. Our new paper in Evolutionary Ecology reviews new findings and questions springing from the Special Issue I guest-edited. It was a great experience putting together this project, and fun to do some brainstorming about the future of the field. Be a Bee: NYT's interactive piece features lab research! 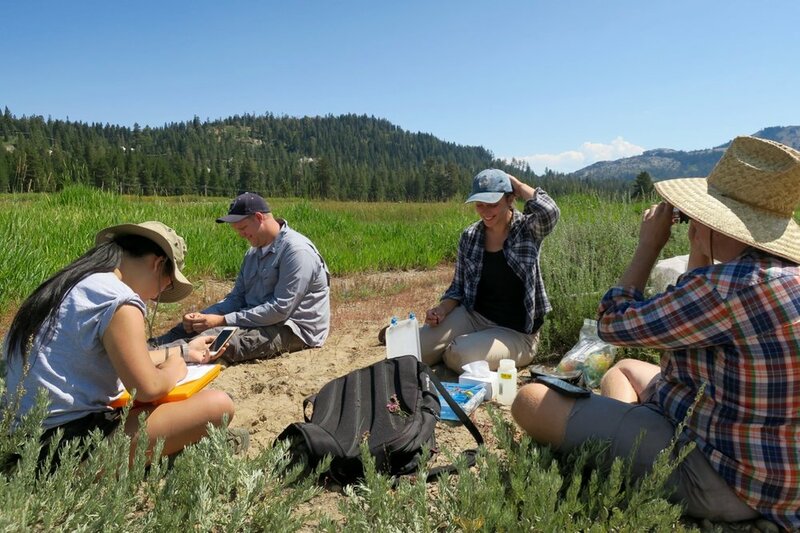 Felicity and I were excited to be interviewed for this piece, which reports on a few recent findings that have expanded our understanding of the bee's sensory world. Among all the other great aspects of this article, nice to get links to the Muth et. al. and Russell et al. papers in Animal Behaviour! 1) The arrival of the new RFID system! It got stuck for 6 weeks in US Customs while they tried to classify it and sort out the paperwork from our German supplier/shipper. We all wish we had taken German in high school. 2) Our pollen taste paper got a nice write-up in the "Outside JEB" section of the Journal of Experimental Biology. Congrats to Dr. Felicity Muth, who received a postdoctoral fellowship from the American Association of University Women! You can read about Felicity's award in Nevada Today! Our new paper in Animal Behaviour is getting some coverage in the Science Times! Click through for beautiful video and article that highlights this work done by Avery Russell! We're super excited about this short video and article put out by Deep Look, a science series produced by childhood-dominating Bay Area PBS station KQED! Filmmaker Josh Cassidy visited our lab for 2 days in April, and got some great footage of our bees on persian violet (Exacum affine). Jake makes a cameo in the footage, and his research is featured in the article by Lisa Potter. It was a great experience start to finish! Deep Look is a great series that combines beautiful footage with truly in-depth science, and I highly recommend subscribing on YouTube! Bees have good taste: new Biology Letters paper out! Request a copy on ResearchGate! The end of the year brought two reasons to attend the Biology Awards ceremony: Simon White successfully presented his Biology With Distinction project to the department, and Devon Picklum received a Wilson Scholarship! The first annual Bee Bake Off was a major success! The first recipient of the Leonard Lab "B" was none other than Devon Picklum, with her sugar bee cream puffs. Emily's bee pizza would have won for "biggest bee" if there was such a cateogory (next year). And reassuringly, Felicity did not use dead bees in her creation. It's an honor to have received the EECB program's Stephen Jenkins Mentoring Award!